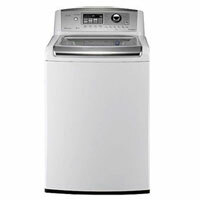 LG introduced another handsome top loader with 5.2 cu. ft. drum capacity, the greatest capacity I’ve come across. With that much space you’ll greatly cut down on the number of loads you have to do. A sanitizing cycle powered by an internal water heater eliminates common bacteria. For convenience, automatic dispensers release detergent and softeners to maximize the cleaning performance. This model can handle almost any load, and its cleaning performance is topnotch. With an Energy Star rating, you can also rest assured that it’s saving you on your utility bills. You can find this model for as low as $600 online, an amazing value.